The scope and scale of IUPUI’s research operation position us well to respond to immediate needs in the community, such as the opioid epidemic. At present, the state of Indiana ranks 15th in the nation in overdose fatalities, and ours is one of only four states where the overdose death rate has more than quadrupled since 1999. School of Nursing Dean Robin Newhouse is leading this comprehensive, multidisciplinary initiative to tackle Indiana’s opioid epidemic in collaboration with partners and communities across the state. Targeting both vulnerable communities and the demand for more professionals trained in health sciences, the IU Student Outreach Clinic is a student-run clinic that provides free medical, dental, legal, and other services to underserved families on Indianapolis’ east side. IUPUI students in the health professions, social work, and law, as well as students from other institutions in the city, volunteer in the outreach clinic each year. Earlier this year, the School of Dentistry received a $100,000 grant from a new Gannett Foundation nationwide program called “A Community Thrives” to expand outreach clinic services for those patients who have nowhere else to go. 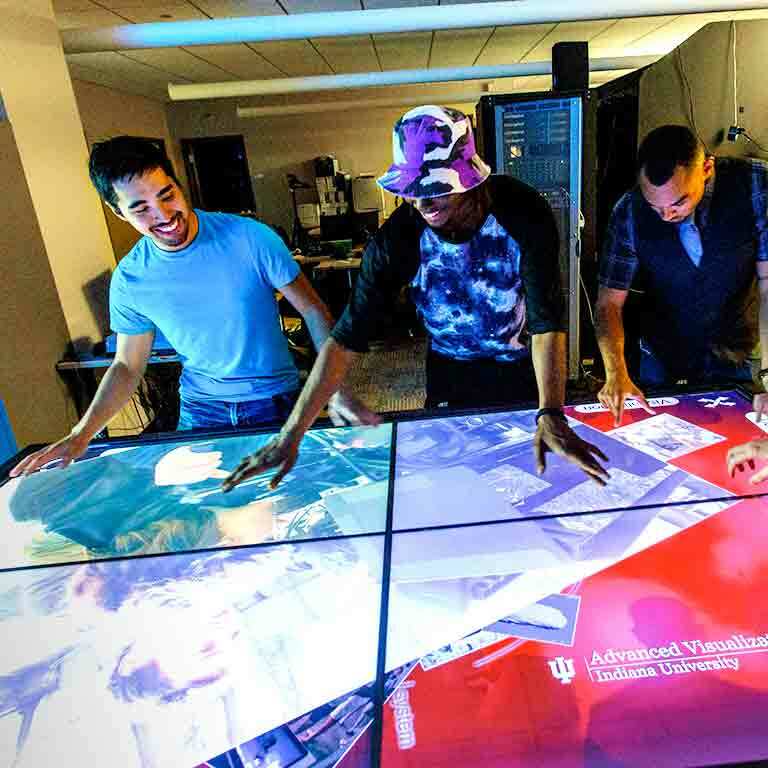 Students work in the Advanced Visualization Lab at the School of Informatics and Computing. An idea to attract more diverse students into STEM programs has become an initiative that can drive Indiana’s workforce. Our award-winning Informatics Diversity-Enhanced Workforce (iDEW) program partners with local businesses to provide cutting-edge IT education to a diverse population of Indianapolis high school students.